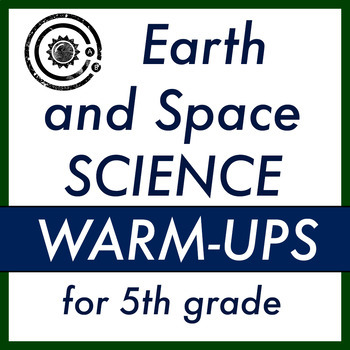 These warm-ups are for the Earth and Space Science unit. They can be used as review or to pre-teach the topics. These are designed to be used in a 5th grade science classroom. 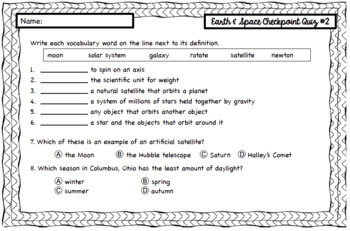 I teach 5th grade science in Ohio, so I create my resources with the Ohio standards in mind (which may or may not be different from your state). My students tend to need a lot of repetition of our science topics with an emphasis on the vocabulary due to low reading levels and a large number of ELLs. I created these warm-ups to supplement my teaching with repetition of the topics in a short, 5-minute format. This set has three weeks worth (15 days + 3 checkpoint quizzes). I am working on growing it as I use it in my classroom. Week 1 is in my store as a free sampler (go try it out!) and weeks 1, 2, and 3 are included in this set. 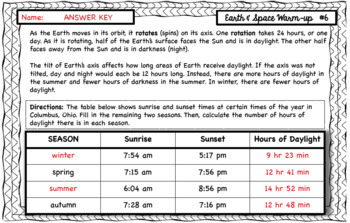 If you purchase this set now, you will be able to download the additional weeks of Earth and Space Science warm-ups for free as they get added to this resource. 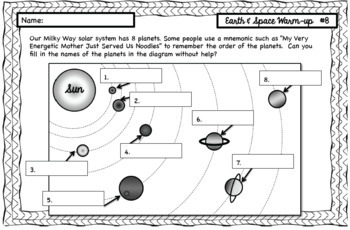 Once I finish Earth & Space, I'll be creating warm-ups for the other science units to use with my class next year, as I've realized I wish I had started using these from the beginning! If you like my products, make sure you follow me! Click the star! I will be posting more 5th grade science products as I complete them and need them for my own classroom.